This review is based on the release version of the game. Since then AurumDust have shipped many patches and updates. In March 2018 under the hands of the studio AurumDust came out the game Ash of Gods: Redemption. The title both attracted me and worried me, because it reminded me of Banner Saga. Ash of Gods is mildly said inspired by Banner Saga and in the following text I will do something that I avoid usually and that is to heavily compare two titles. Is Ash of Gods imitating Banner Saga, is it better, is it worse? All these questions will be answered in the following text. But first - what makes Banner Saga the awesome game it is (opinion me, as always)? Two separate reviews are written on the topic, but in short what make Banner Saga so good are it's hand drawn gorgeous world, it's captivating narrative with tense story, realistic situations, hard, meaningful decisions and real, breathing characters. The battles in the game are challenging, the game has polished, deep mechanics, vast roster of warriors and a bunch of viable play styles. The above mentioned characteristics will also be the ones I will use for the comparison with Ash of Gods. Ash of Gods has its faults and I will talk about them in a little, but how it looks is not one of them. In it's looks Ash of Gods greatly remind me of Banner Saga with it's hand-drawn style. The difference is that unlike Banner Saga, Ash of Gods take place in a more medieval setting. In battle characters have nice fluid animations when attacking or using skills. For some reason though everyone while fighting calmly stride around the battlefield and when stricken their knees buckle. I clearly understand that animations are one of the things that gives the feeling that your attack is doing something, but when everyone react the same way...it does not work so well. The sound is in general good although you can hear it bug off when some skills are used in certain situations. For example AoE sword skills used on less than the maximum targets. The music is good but unimpressive without much value for immersion. This is where Ash of Gods fails and it fails hard. The story idea is decent, but the characters feel flat, the dialogues are awkward. The game tries to set up dark, gritty atmosphere, but it manages just a bit of a tense situations where few action heroes through a lot of swearing and killing manage to get stuff done. Even one of the main characters feel weird as his lines are contradictive and make him feel like two different people. I know that the original script is written in Russian and all this might be because of a poor translation, but this does not change the facts...it makes it even worse. Also the choices you make do not feel as important. Stuff depend on what you do, but first the resolutions of your actions are long time after making the decisions, second they do not feel as impactful. 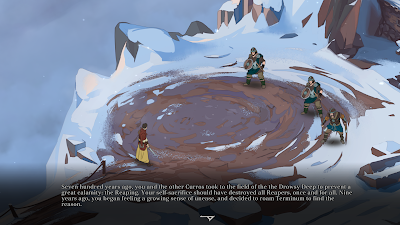 Banner Saga will kill off characters of importance if you are not careful. After I talked about the worst in Ash of Gods, let me tell you about the best. Biggest flaw of Banner Saga is its linearity. You do not have a choice where to go, you just follow the story. 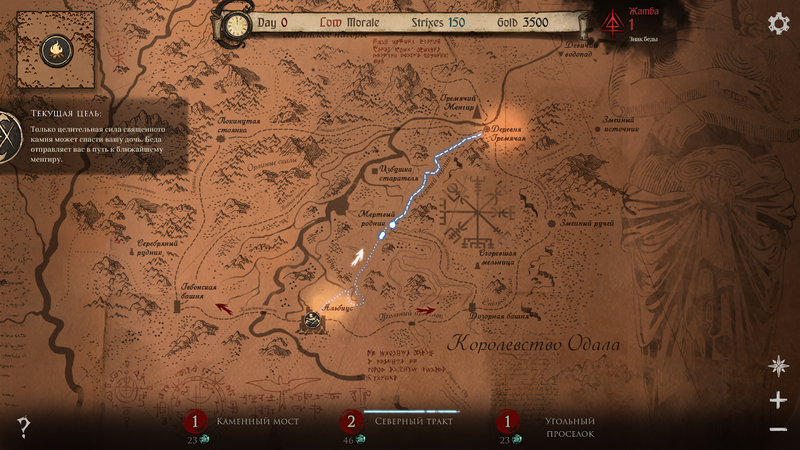 In Ash of Gods you have few choices, mainly what way to go on the map toward your goal. These choices while minor still breed in some fresh air as they bring different events and some replayability of the game ( If you can get past the horrible dialogues and boring characters.). 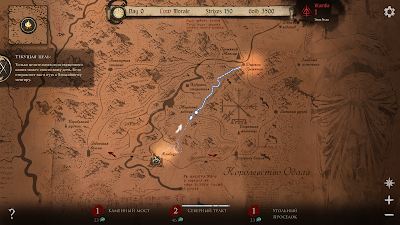 Sadly all the traveling is done on the map alone and there are no gorgeous views to enjoy while wondering what crisis the game will hit you with. When you arrive somewhere you can choose between places in the area which to "explore". 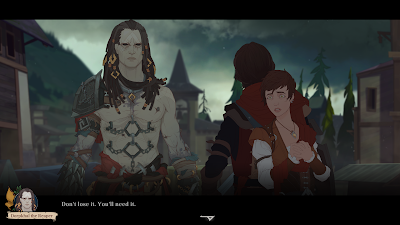 Again, very similar to Banner Saga where instead of places to visit, you had people to talk with. But I said I will talk about the best and this is far from the beast. The best are the battles. The battle is turn based, where your chosen before the fight warriors fight against the enemy. So far nothing new, right? 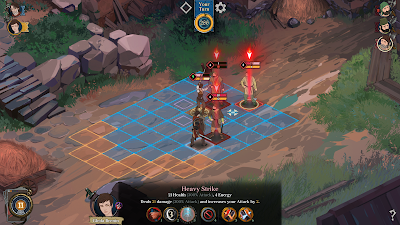 What makes it different are two main mechanics - power cards(or whatever is called in the game) and that you can choose with whom to act when it is your turn. The power cards are exactly what they sound like - every turn you can play one of limited number of cards. They are either buffs or harmful for the enemy effects. During your playthrough you will be able to find, craft and buy more cards. The really interesting mechanic is the second one - you choose who to use when it is your turn. Of course when you play with some one you cannot use them until you take turn with everyone else from your squad, but what this does is gives you immense freedom during battle, you decide how and when your men and women will act. You need your archers you got them, you need your melee to intercept someone, great, done. The mechanic feels great and it was the sole reason I enjoyed the combats in the game so much. Other than that the units have two stats - health and magic and both can be attacked. To use skills you will need to pay either with magic or health, but if you do not have magic you take double damage to your health. The characters have good, variable pools of skills including stances which give enough freedom how to and for what to use your fighters. Speaking about them, in the course of the game you will be able to level your guys, improve their abilities and equip them with items. From the whole game this is probably the best part even if it has its flaws like the speed and how everybody walk calmly around and the animations when someone is struck. As much as I do not want to say it, Ash of Gods is a copy of Banner Saga which lacks most things that make Banner Saga the great game it is. It almost seem like AurumDust have made a checklist for their game but first of all have not polished each peace of the game and second they have missed to make the separate things from the checklist to work well with one another. Публикувано от Sharki в 22:37 ч.